Snowy the Perfect Pet is the first voice activated interactive plush toy dog from Fizz Creations. Brighton-based Fizz Creations usually specialize in novelty gifts rather than toys. An absolutely guaranteed mess-free voice activated Perfect Pet, Snowy the cuddly dog will always do exactly as she’s told. Using clever voice recognition technology Snowy can lie down, beg, come here, perform dance routines and do push ups. Snowy the Perfect Pet, though stuffed with animatronics, is also soft enough for any child to enjoy cuddling. 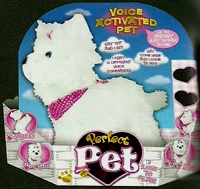 It’s not hard to imagine Fizz Creations extending the Perfect Pet brand into many other interactive plush lines. This entry was posted in Perfect Pet and tagged Perfect Pet Toys. Bookmark the permalink.